I was stressing Monday when I was going through my human subjects application. I've always found that baking really helps me destress. Plus, I've been wanting to make these suckers for a while now. I made the full recipe of dough, and rolled them all up into rolls and made the 'slices' with dental floss. I ended up letting one batch rise as usual, and the other half I froze for cinnamon rolls at a later date. These were best out of the oven, steaming and nutty. What I liked best about these is that the dough was not overly saturated with stickiness. 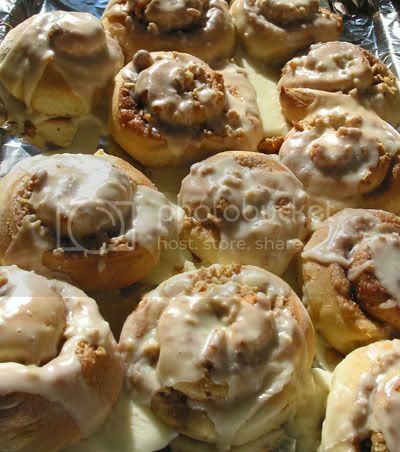 Of course the frosting was sweet and sticky, but the actual rolls still had that nice pastry/breadiness. And the chopped walnuts REALLY stood out in a delicious way against the browned dough. I would definitely do this again. 1. heat 1 cup milk, water, and 1/4 cup butter until very warm (butter doesn't need to be completely melted). (I microwaved it all for 40-50 sec). Place milk mixture, salt, flour, yeast, sugar, and eggs in the pan of the bread machine in the order suggested by the manufacturer. Select the Dough cycle. Press Start. (or use your kitchen aid with the dough hook attachment). 2. Once Dough cycle is complete, remove the dough from the bread machine. Punch down, and divide into 2 parts. On a floured surface, roll each part into a large rectangle. (I think I rolled until it was about 1/2" thick, but it certainly doesn't have to be precise). Smear each rectangle with the softened butter. Combine the cinnamon and 3/4 cup sugar. Sprinkle over the rectangles. Generously sprinkle the raisins and/or chopped nuts over the top. 3. Roll the dough up into two logs starting at the long side. Cut each log into 12 slices. (here is where you can use dental floss or thread to make the slices. Slide the thread under the log, wrap around the log, and pull ends past each other). Place the rolls cut side down into two 9x13 inch greased baking pans (or silicone sheet). Cover, and let rise in a warm place until almost doubled (about 30 minutes). 4. Bake in a preheated 375 degrees F (190 degrees C) oven for 18 to 20 minutes, or until golden. Combine the confectioners' sugar, 3 tablespoons melted butter, vanilla, and 3 tablespoons milk. Frosting should be thick. Spread over baked rolls and enjoy.